►Need a Cigarette Receptacle Fast? 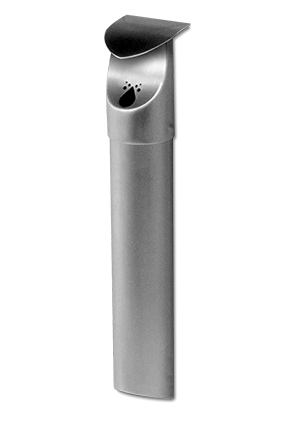 This sleek Leafview stainless steel cigarette receptacle is designed to be mounted to a wall or the Leafview receptacle. The easy-access opening and oxygen-restricting design makes cigarette disposal convenient. Mounts to the Leafview trash receptacles or outdoor wall or column. Hex key lock and unique lift-twist mechanism keeps unit in place and deters theft. The secured cigarette receptacle can be emptied by unscrewing base with the hex key (included), lift and twist to release tube base from top. The unique "J" channel keeps base attached to lid once screw is removed.